Anders J. Thor was born on 4 December 1935 and obtained a Master’s of Science degree in electrical engineering at the Royal Institute of Technology (KTH) in Stockholm in 1959 and the degree of Tekn. L. in mechanics and mathematics, also at KTH, in 1964. He was lecturer in mechanics at KTH from 1962 to 1965 and became a senior lecturer (professor) in 1965. He also worked part time at the Swedish General Standards Institution, where he took responsibility for two projects: (1) Quantities and Units as secretary of the Swedish National Committee and the ISO/TC 12 in 1982 and (2) Technical Energy Systems at the Swedish National Secretariat. A nice summary of his attitude towards his work can be found in an interview from 1996.1 Even after retirement he remained very active in his field. Green Book authors in 2006 (right, from front to back): Anders J Thor, Martin Quack, Jürgen Stohner, Franco Pavese and (left, from front to back) Roberto Marquardt, Ian Mills, Tom Cvitas, and Jeremey Frey. From 1994 to 2001, Thor was an associate member of the Commission on Physicochemical Symbols, Nomenclature and Units (Commission I.1). From 2006 on, he was a national representative to the commission, representing the International Organization on Standardization (ISO, Technical Commission 12). He had joined the Green Book working group and contributed substantially to the discussions about the third edition when the group met in 1999 in Engelberg, Switzerland. 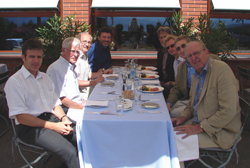 This difficult and extensive project was finalized in 2006 and the picture below shows those authors of the IUPAC Green Book present at the dinner in Zürich after final corrections were implemented. He was also engaged in the Green Book abridged version, which is currently in preparation. Anders often had strong opinions, and almost as often expressed them quite forcefully. But at the same time, we remember him as a member of our group who was always willing to discuss every question, every detail in a friendly way. In the following quote from his 1996 interview,1 he discusses the stability of conventions, a subject dear to his heart: “These should have strict rules, but there should be one rule and it should be stable for some years before they change it. . . . Metrication, of which the SI is only the top, has gone on for 200 years and is still going forwards. Therefore, it doesn’t really matter if it is this year or next year, but only that you go in the right direction. Then, if we have patience, after another 100 years the metrication process will be complete. Of course, I would have hoped that it could come while I’m still alive . . .” Regrettably, Anders left us much too early to see the metrication process come to an end. He died on 7 April 2012. IUPAC and ISO/TC12 have lost a knowledgeable man and an expert in standardization. The members of the Green Book working group have also lost a good colleague and a true stable friend. The members of Commission on Physicochemical Symbols, Nomenclature, and Units (I.1): Kozo Kuchitsu; Roberto Marquardt, vice president Division I; Martin Quack; Jürgen Stohner, chair Commission I.1 and secretary ICTNS. 1. A.J. Thor, “Keeping Up Standards. Pretty Darn Quick” in Friendship Among Equals. Recollections from ISO’s First Fifty Years, p. 69–79, ISO Central Secretariat, ISBN 92-67-10260-5 (1997) <www.iso.org/iso/2012_friendship_among_equals.pdf>.